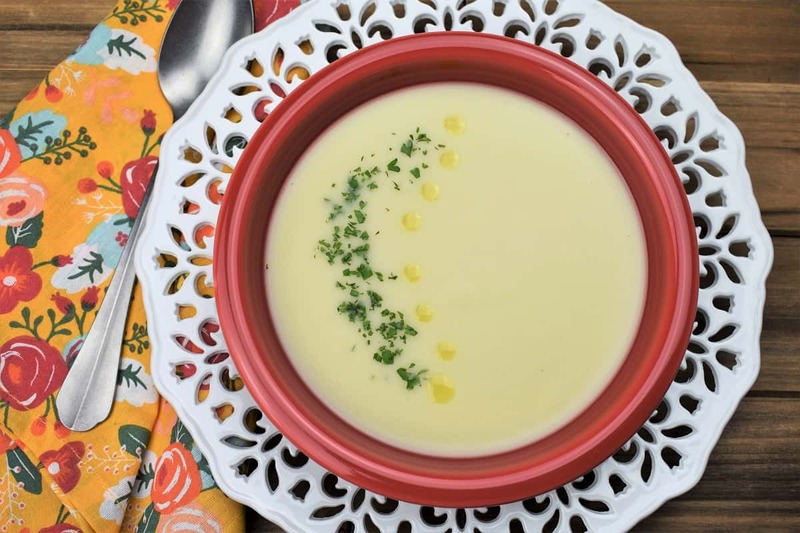 Crema de Malanga is a thick, creamy soup, made creamy more by the texture of the Malanga root than actual cream. 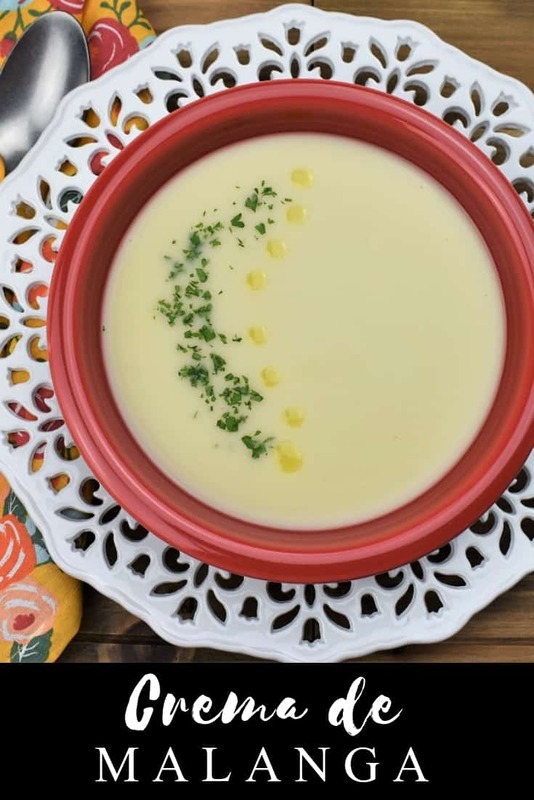 Easy to make using simple ingredients, this Malanga soup is a delicious way to try something different. 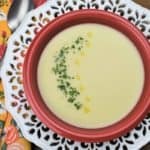 So browse your grocery’s produce aisle, if you see an odd looking, hairy tuber hanging out near the potatoes, pick it up and try this amazing soup. If you’d like to try more Cuban classics, try this Cuban corn stew, these tostones or the staple, Cuban style red beans. Enjoy! 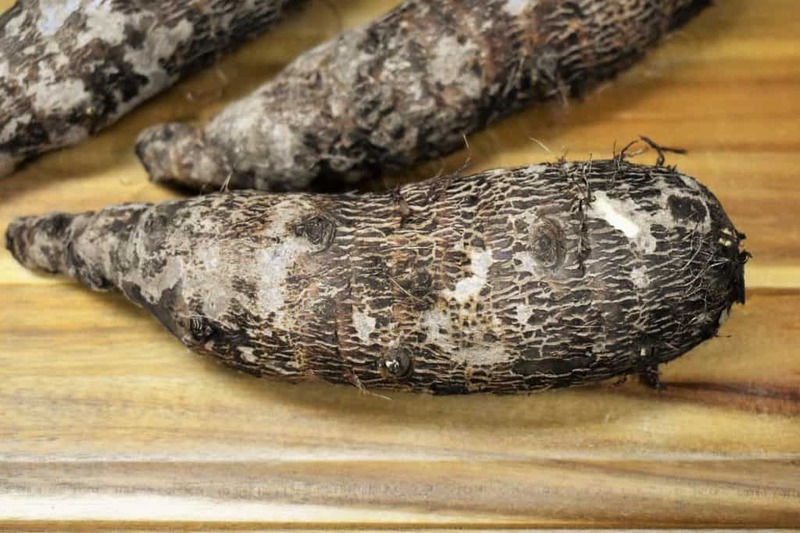 Malanga is a brown, hairy tuber that has a white, fleshy inside. It is cultivated in many tropical regions. Malanga has an earthy taste with a texture similar to a waxy potato. In Cuban cuisine, Malanga is used in stews, soups, as a mash or simply boiled and topped with a drizzle of olive oil. A Malanga puree is commonly used as a nutritious meal for someone who is under the weather. Peeling a Malanga can be tricky. The wiry, thick exterior doesn’t work well with a peeler. The white inside is very slippery too, take care when handling. Using a paper or kitchen towel will help you get a good grip. I’ve found that peeling the Malanga much like you would a butternut squash is effective. Cut the ends off, then cut it into two or three pieces. Stand the Malanga on the widest part then cut off thin slices working all the way around. Once most of the peel is gone, be careful as the Malanga is very slippery. Peel the Malanga and cut it into roughly 2 inch pieces. 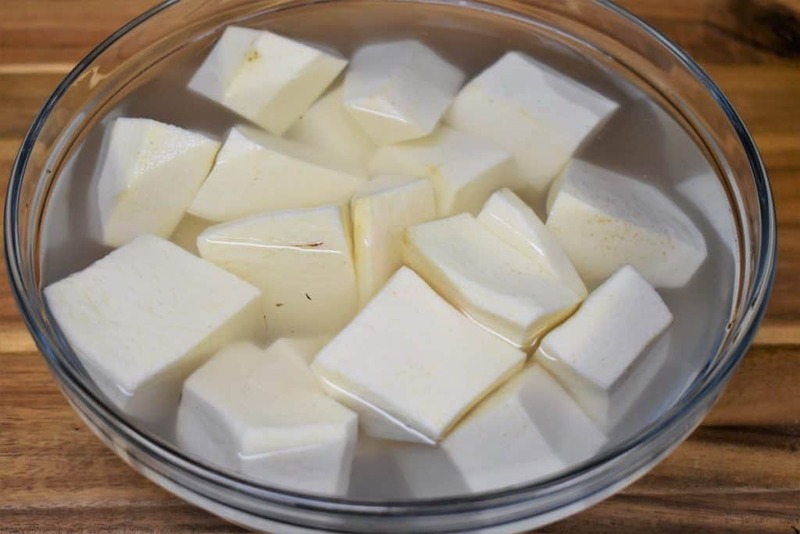 Place the peeled Malanga in a bowl with cold water. Once you’re done peeling rinse and cover with cold water again. Drain the water before adding the malanga to the pot. Add the butter and olive oil to a large pot over medium heat. When the butter is melted and foamy, add the onions to the pot. Cook the onions for approximately 2-3 minutes, stirring frequently. Add the garlic and cook for 1 minute, stirring almost constantly. Add the Malanga and chicken broth to the pot and stir. Raise the heat to high and bring the liquid to a boil, stirring occasionally. As soon as the broth is boiling, lower the heat to medium-low and cover. Make sure the liquid is not boiling too vigorously, if it is; lower the heat a little bit. 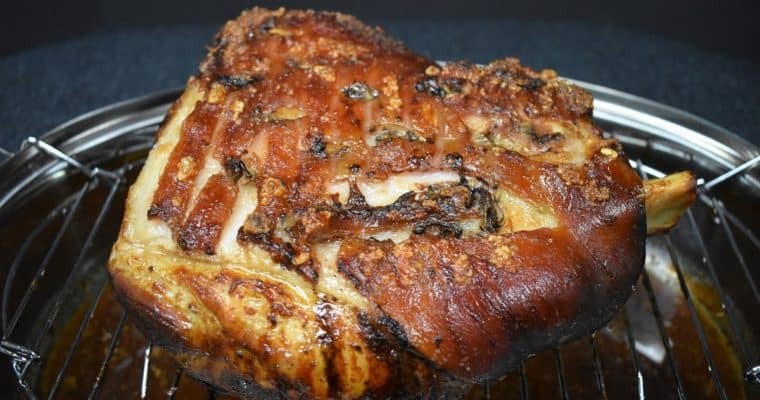 Cover and continue cooking for anywhere from 40-50 minutes, stirring occasionally. 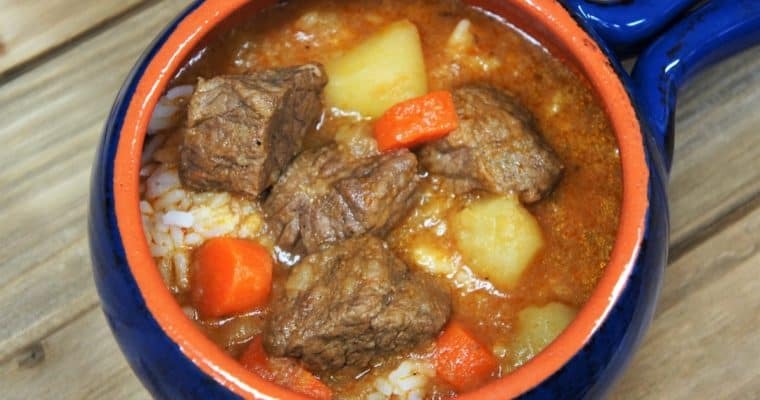 The Malanga is done when it is very tender and breaks apart easily when pressed with a spoon or fork, the broth should be cloudy and thickened too. Take the pot off the heat. Heat the milk in the microwave or in a small saucepan. Still off the heat, add the milk to the Malanga soup, stir well to combine. Place the pot over medium to medium-low heat the warm through. Do not allow the soup to come to a boil. Taste the crema de Malanga and add salt to taste. Garnish with a little chopped parsley and drops (or a stream) of olive oil, if desired. Serve and Enjoy! Add the butter and olive oil to a large pot over medium heat. When the butter is melted and foamy, add the onions to the pot. Cook the onions for approximately 2-3 minutes, stirring frequently. Add the garlic and cook for 1 minute, stirring almost constantly. Add the Malanga and chicken broth to the pot and stir. Raise the heat to high and bring the liquid to a boil, stirring occasionally. As soon as the broth is boiling, lower the heat to medium-low and cover. (if the liquid is boiling too vigorously, lower the heat a bit). 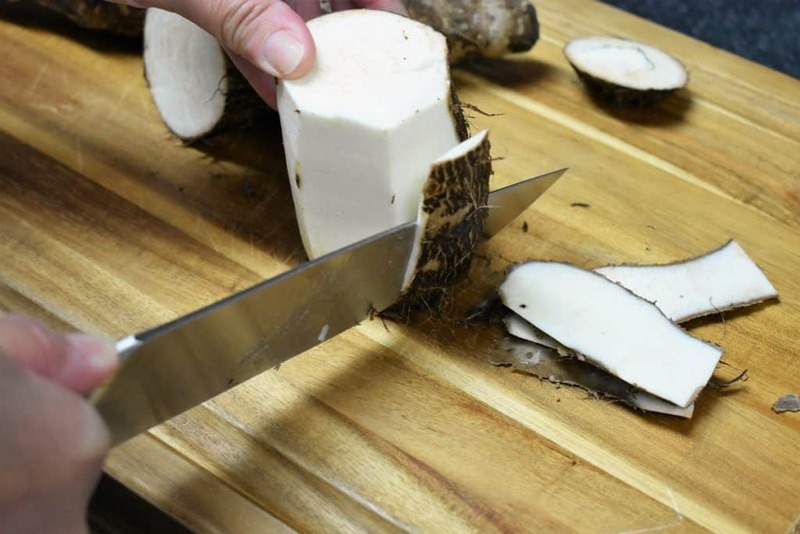 Cook until the Malanga is very tender and breaks apart easily when pressed with a spoon or fork. about 40-50 minutes, stirring occasionally. Peeling a Malanga can be tricky. The wiry, thick exterior doesn’t work well with a peeler. The white inside is very slippery too, take care when handling. Using a paper or kitchen towel will help you get a good grip. I’ve found that peeling the Malanga much like you would a butternut squash is effective. Cut the ends off, then cut it into two or three pieces. Stand the Malanga on the widest part then cut off thin slices working all the way around. Once most of the peel is gone, be careful as the Malanga is very slippery.